Father Christmas himself will be there - you can book a time slot at the reception on the way in and I have to say, last year the Grotto was lovely, Father Christmas and his helpers made my children so happy and the gift was perfect - looking forward to going along again this year - I'll be heading for the crafts first! There's an area for children only where they can go and buy or make a gift for parents. Lots of stalls, gifts and games to take part in. Treasure hunt: We’ve got an exciting new treasure hunt for the children this year. It will cost £1.50 to participate and all those who complete the treasure hunt get an exciting prize which they can collect at the Lucky Dip stall. Santa Claus bookings: Santa Claus will be paying us a visit on the 6th and this year, to avoid queues, we will be introducing a booking system so that you have a dedicated time reserved per child, to visit Santa. 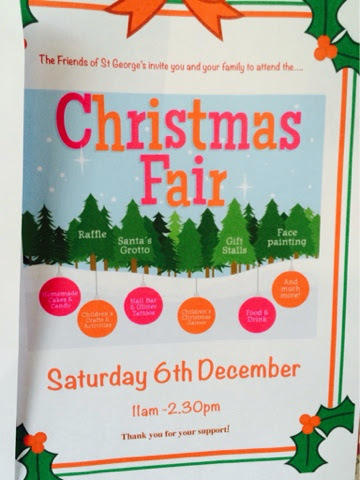 Bookings will be taken at the fair in reception area from 11-11:30 and thereafter at the entrance to the Santa Grotto. The cost will be £2 per child. Raffle prizes: Be sure to get your raffle tickets this year to be in with a chance to win prizes including: *an iPad mini *his and hers hampers *children’s hampers *pamper hamper *Thames Clippers Family Roamer tickets *2 cinema tickets *Voucher for Pink Garlic restaurant *Voucher for Fired Up pottery.